In October 2016, the USS introduces a DC section (the 'Investment Builder'), which will become a significant part of benefits for high earners, and could provide useful additional flexibility in retirement for other employees. From a member’s point of view, these DC options are very complicated. This webinar will look at the best way to ensure employees get the best from the Investment Builder, so that they value the benefits, and help employers understand the impact on employees’ retirement plans. 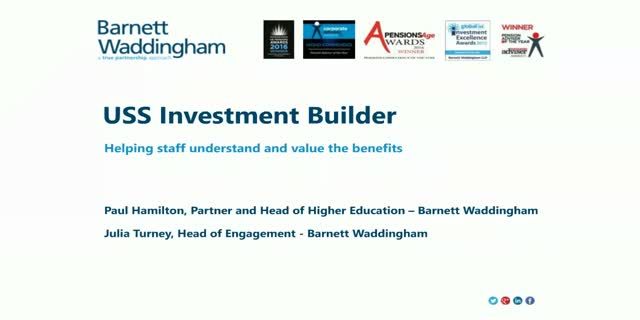 Paul Hamilton, Partner and Head of Higher Education and Julia Turney, Head of Platform & Engagement - Barnett Waddingham. Presented by: Paul Hamilton, Partner and Head of Higher Education and Julia Turney, Head of Platform & Engagement - Barnett Waddingham.